Coronation Party Dutch Style | Marbella Marbella – Adelante! Enjoy and soak up the amazing and infectious party atmosphere emanating from a genuinely enthusiastic public shortly after the coronation of his Royal highness King of The Netherlands Willem-Alexander and Queen Máxima. Armin van Buuren voted the worlds number one DJ, did a special live performance in front of the newly crowned monarchs and about 15.000 delirious and excited fans. Together with the Royal Concertgebouw Orchestra, Armin performed an orchestral version of the title track of his upcoming album ‘Intense’ as well as the popular ‘The Bolero’ during the ‘Koningsvaart’, a special, cultural boat-trip in the City of Amsterdam, the King and Queen completely surprised both the crowd as well as the artists, by getting on stage, joining in the fun and dancing along with the music and as the video shows, it was well received by not only the audience, but by the orchestra, the conductor and Armin. Dutch people in their millions dressed in orange, celebrated a once-in-a-generation milestone for the country following 33 years of reign, Queen Beatrix abdicated in favour of Willem-Alexander. 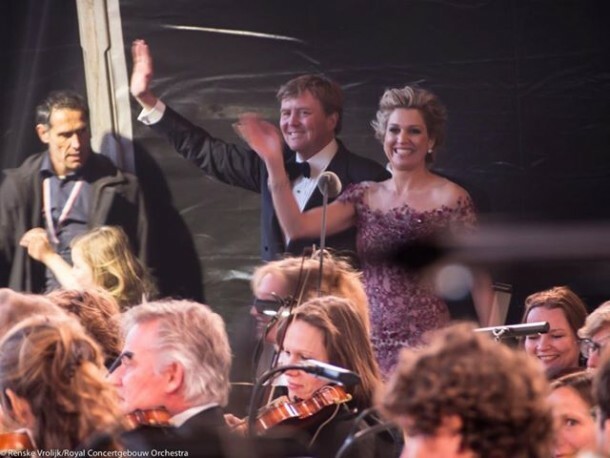 The King and his Queen Máxima requested that Armin van Buuren be a part of the musical program performed on April 30th 2013. After weeks of rehearsal, the world’s number one DJ and one of the world’s best orchestra’s came up with a flowing mix of electronic dance music and classical music. The new crowned King and Queen and their three princess daughters spontaneously decided to get on stage and shake hands with Armin, as well as welcome the thousands of people in the crowd wearing orange hats and crowns.